I have such love for Nick Hornby. A romance writer under the guise of lad lit and music lit. Every book has an angsty bloke and every bloke gets the girl in the end. And Juliet, Naked is no different. I usually stop reading a book that will send me to sleep but this one had an epistolary element to it and I felt I needed to persevere. I’m glad I did as it guaranteed me a Nanna Nap per sitting and I was much more refreshed when I awakened. Don’t get me wrong here, for I adore Jennifer Crusie as a writer. She is in my top 2 authors ever. I lubs her muchly. And also in my top 2 books ever is Jennifer Crusie and Bob Mayer’s book Agnes and the Hitman. Yet, Don’t Look Down took me 3 years and a number of false starts before I managed to push past a Nanna Nap on page 7. Yes, every attempt had me nod, nod, nodding off. In the end, the book was a decent adventure/romance read. Reading this book became such a sure thing for having a Nanna Nap that it almost defied the rule of a Nanna Nap being unplanned. Tired but can’t get to sleep…perhaps Conrad’s description the ships lying in wait for the Thames wash is the answer, as time and time again this had me breathing little “ks” of sleep. Once again, I persevered and love this densely descriptive book. I love Greek Mythology and I particularly love hearing the stories told rather than reading them as they represent thousands of years of oral storytelling traditions. All I remember of this audiobook is driving onto the expressway heading out of Sydney for Nelson Bay and then waking up outside of our hotel 2 hours later with both my sons telling me about the gory killing and maiming they heard in the story. Two things stand out in my mind. The first is that I loved their excitement for the story and the second is how grateful I felt that I was not the driver. Since that day, unless it is a comedian, I never listen to audiobooks when I am the driver. This was one of the 9 books that I removed from my home in my annual purge of books I will never read. I recall opening the book. 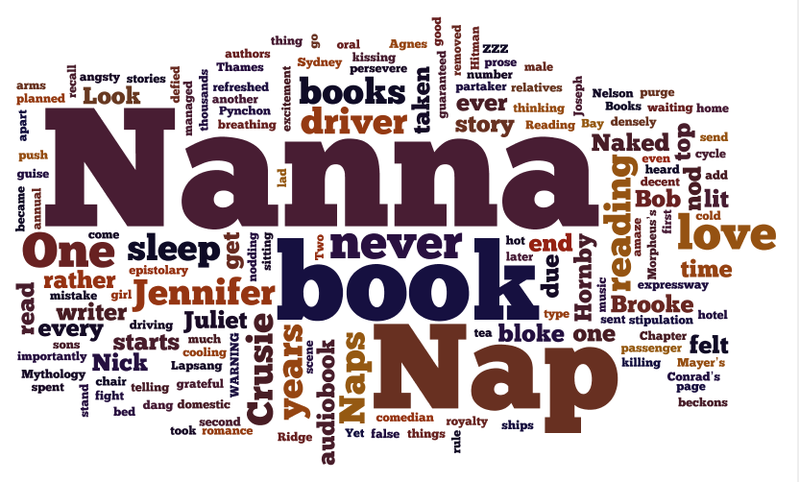 I think Chapter 1 starts with a domestic scene and then…..zzz (a Nanna Nap beckons me even as I type about this book). ← June was a quiet month…. I think it depends on where you read as to whether a nanna nap can occur in a bed or not. If you read lying on the couch and you fall asleep whilst reading a book or watching TV, why is that different to falling asleep reading your book that you just happen to be reading in bed? Can you tell that I generally read in bed – mainly because the bedroom is my space and I won’t get bothered too much there.